Tingue remanufactures flatwork ironers for laundries to original specifications or better. With the skill and experience of more than 100 years of laundry machine manufacturing and rebuilding, Tingue remanufactures your flatwork ironers to deliver higher performance with greater energy-efficiency than ever before possible. At Tingue's fully-equipped manufacturing center, Tingue technicians dismantle the entire flatwork ironer system by system, part by part. Each individual part - from the frame and rolls to the gears, chains and tiny drivetrain components - is cleaned and carefully examined with both advanced inspection technology and the trained eye of experience. Worn parts are replaced or machined on state-of-the-art CNC machining centers. When complete, your rebuilt flatwork ironer will perform as specified for years to come, with less maintenance and higher productivity than before - yet at a fraction of the cost of a new flatwork ironer. Tingue's Right Hand Drive Conversion, Raising Rig and other advances may be included during a rebuild. 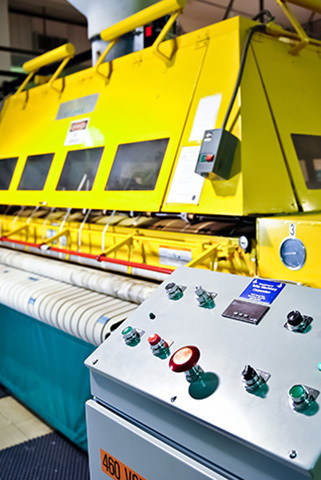 Adding these modern-day technology upgrades to an aging flatwork ironer boosts energy-efficiency, strengthens worker safety and cuts operating costs. Your enhanced, rebuilt flatwork ironer not only performs as well as when new but it performs like a new ironer designed and built today but at less cost. Your Tingue ironer technician can assess if your ironer performance can be improved with minor adjustments or whether it warrants a complete rebuild. For an on-site inspection of your flatwork ironer, call 800.222.9954.